Fall is finally here (both officially and weather wise)! We were getting 90 degree temps here up until last week but now it finally FEELS like fall. And what better way to welcome fall than with some favorite comfort foods? Usually in fall we go for hearty soups, but today I’m sharing a chili cheese dog casserole that is one of my husband’s favorites. Now you might think “well chili cheese dogs aren’t healthy” and you would not be totally wrong BUT this recipe packs a bunch of veggies, beans and other deliciousness into a dish that tastes sinful but really is healthier than you might think! The chili cheese dog casserole recipe is SUPER easy to throw together, and if you make a double batch you can freeze it for lunches or a super fast weeknight dinner. What I love about this recipe is that you can throw in extra veggies and your kids (and husband) will happily gobble them up, blissfully unaware because the rest of the dish is so darn tasty. It’s perfect for those cold fall and winter nights. I’m telling ya, it’s really good, fills you up and is so cheap to make because you can use whatever you have on hand. That’s a winner in my book for sure. I used S&W Beans for this chili cheese dog casserole recipe because I love their quality and variety of flavors. This time when I made it I used white beans, but kidney, pinto or black beans would all work as well. 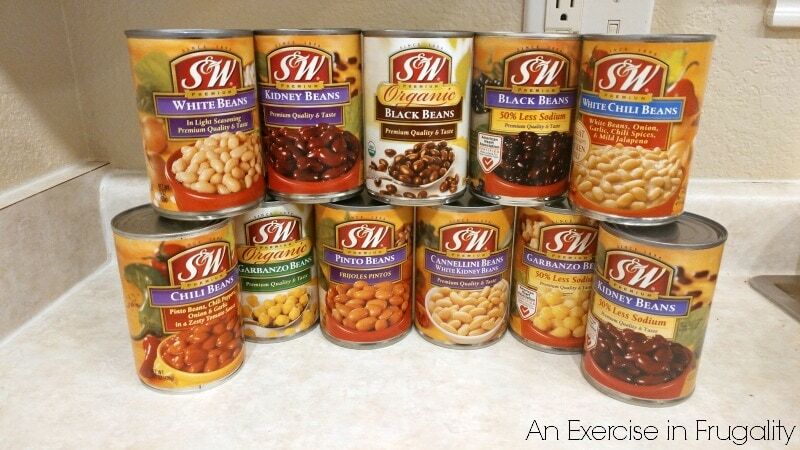 Not only are beans an inexpensive way to stretch meat in your favorite recipes (see my previous post about how to save money using beans here) but also you can grab a coupon for S&W Beans for even more savings! This recipe is so easy and very flexible because you can put your favorite veggies in here. I used bell pepper, tomato and onion, but you could easily add other favorites like corn, okra, celery, cactus, zucchini….get creative! The flavor of the chili is strong enough that your family won’t notice the vegetables, so it’s a great way to sneak them in for picky eaters. If they are REALLY picky, you can always use a food processor to mince them really fine so there’s no chunks in your chili! Now, before you argue that hot dogs and chili aren’t healthy, you can use whatever organic, grassfed, nitrate free hot dogs that your family prefers, and you can make your chili from scratch. For convenience and cost-effectiveness though, I went with a basic canned chili and inexpensive, basic hot dogs, but you do you boo. Whatever your heart desires! Drain canned tomatoes and beans well. Combine diced veggies, beans, garlic and chili. Line bottom of large baking dish with sliced hot dogs. Bake at 400 degrees for 15-20 minutes until hot and bubbling. I recommend slicing the hot dogs into “coins” instead of larger pieces as this just makes it easier to eat. You could do whole hot dogs if you prefer, but we found pre-cutting made it easier. Also, you can top this with your favorite chili or chili dog toppings (try sour cream, chives, salsa, etc). You really can’t go wrong with this basic recipe. It’s easily customizable to your family’s tastes. You can do a spicy chili, vary up the veggies or add toppings to really make it your own. You can even switch up the kinds of beans you are using. S&W has some of the highest standards in the industry and they offer a wide variety of different beans, some of them are really unique! Plus, let’s face it-canned beans are much more convenient than trying to soak dried beans. When I need a meal fast, these are what I reach for and I’ve yet to be disappointed! I should note, since we try to watch our carb intake, this is a lower carb option for us. 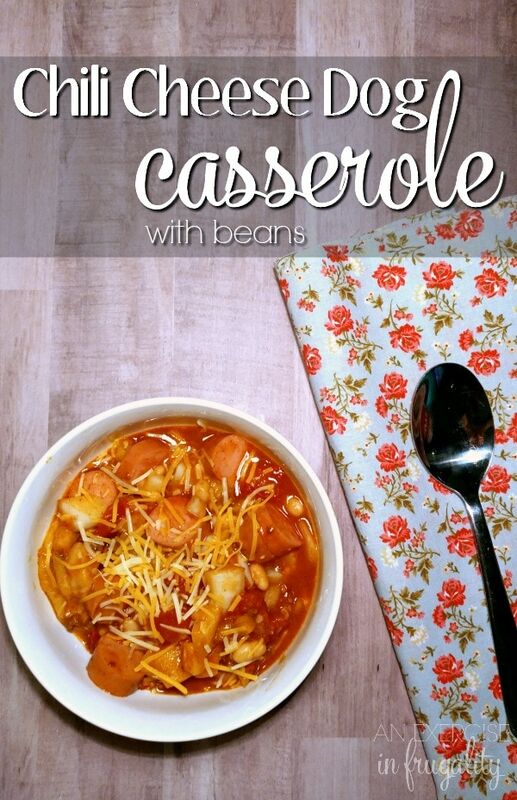 The beans do add some carbs but you’re not eating much of them so it’s still a relatively low carb dish, especially compared to eating a chili dog (or two) with buns. If you aren’t watching your carbs, you could scoop this onto your favorite hot dog roll or bun for a fun twist on a perennial favorite! 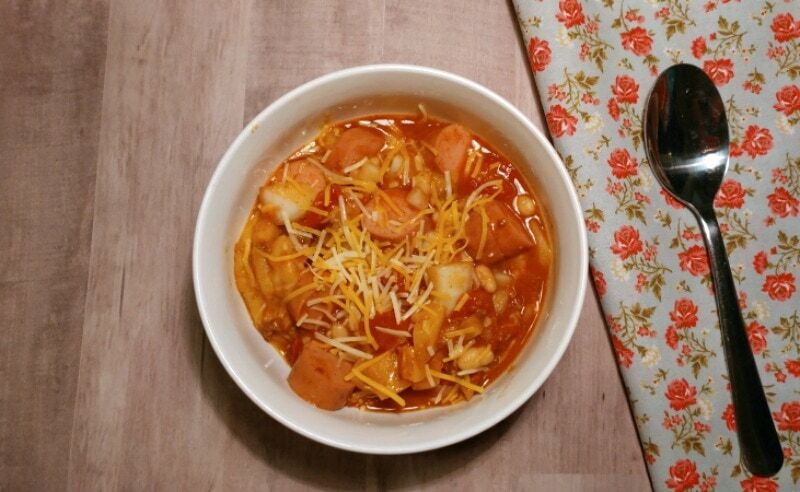 What do you think of this chili cheese dog casserole?